Lake Taal is an interesting freshwater ecosystem to study. The complex interactions of its geological origins, its location, and the presence of the world’s lowest active volcano led to the evolution of a diverse flora and fauna. Its fisheries are integral to local communities and have sustained them for centuries. In the past three decades, however, the biodiversity of Lake Taal has been threatened by aquaculture. This has eventually led to poorer water quality and alteration of species’ structure. Fewer scientific research studies on Lake Taal have been published, which has also led to a lack of sound management policies that would have helped alleviate the current problems of the lake. This research study will focus on determining the range of Lake Taal’s biodiversity and will shed light on the impacts of aquaculture, newly introduced species, and climate change on the native flora and fauna of Lake Taal. The findings of this study will be compared to the existing records, and significant differences are expected, given the dynamism in taxonomy and systematics, as well as the newly available technology. The research team will collaborate with experts from the California Academy of Sciences (CAS) who are currently documenting the biodiversity of the Verde Island Passage. Lake Taal’s proximity and close geographic link makes it highly possible for Lake Taal to be home to an equally diverse set of organisms. The researchers anticipate that this project will open opportunities for scientifically sound recommendations to be integrated in future lake conservation plans. The research results will be shared through peer-reviewed publications, presentations, community discussions, and museum exhibits. Since the evaluation of the current state of Lake Taal’s biodiversity is already long overdue, much effort will be put into research result dissemination through valid avenues to ensure that other scientists and policy makers would have access to reliable data on Lake Taal’s biodiversity. This study will also ensure that the surrounding communities in the area would gain a better understanding and appreciation of the lake, which plays a significant role in shaping their livelihoods. The outreach and education activities will be designed to help communities integrate responsible aquaculture processes into lake conservation efforts. A museum exhibit on the biodiversity of Lake Taal will help increase public awareness on the importance of Lake Taal as a biodiversity hotspot, given how its native flora and fauna must cope with external pressures from anthropogenic and natural sources. The involvement of young scientists will help build a more educated and scientifically inclined community. Dr. Papa and his team conducted extensive field work to collect samples. (photos courtesy of Dr. Papa). Field work conducted by the team in the last quarter of 2015. Almost all activities for April through June 2016 were focused on preparations for the 1st Philippine Symposium on Freshwater Biodiversity and Ecosystems (PSFBE). This symposium was one of the major highlights of the project, hosted by the University of Santo Tomas, together with the California Academy of Sciences, PUSOD Inc., University of the Philippines – Institute of Biology, Ateneo de Manila University, the Association of Systematic Biologists of the Philippines (ASBP), the Biodiversity Management Bureau, and the National Fisheries Research and Development Institute (NFRDI), in cooperation with the International Society of Limnology (SIL). This 4-day event was designed to gather international and national experts from the different fields of limnology and freshwater biodiversity. It served as a venue for dissemination of current research updates from the Philippines and abroad, as well as a showcase for the results of this PEER project on Lake Taal biodiversity. A total of 143 people attended, including participants from Philippine government/research institutions (53), University of Santo Tomas (26), other Philippine universities (52), the National University of Singapore (11) and Khon Kaen University (1). There were a total of 20 guest speakers from local and international institutions based in the Philippines, China, Singapore, Taiwan, Japan, and the United States. One of the most exciting parts of the symposium was the Taalaman exhibit. Dubbed as Lake Taal’s first biomuseum, this exhibit featured the rich biodiversity of the lake, raising awareness of the need for protection and conservation of its natural wonders. The exhibit had two setups: a dry exhibit, where informative posters about Lake Taal and its biodiversity and photographs of notable Philippine lakes were displayed, and a wet exhibit, which showcased live specimens of fishes, amphibians, reptiles, arthropods, and aquatic plants contained in glass aquaria. The former was held at the UST Museum Gallery, while the latter was displayed at the UST Main Building Lobby. The exhibit ran until June 17, 2016, and was covered by various print, on-line, and broadcast media outfits, which really helped increase awareness of the biodiversity of Lake Taal through more popular means. After closing the Taalaman exhibit, principal investigator Dr. Rey Donne Papa, with project leader Dr. Richard Thomas Pavia Jr., research assistant Milette Mendoza, and graduate student Kristine Idda Pontillas headed to San Francisco, California, as visiting researchers at the California Academy of Sciences from June 20 to July 18, 2016. Their trip was focused on taxonomic, laboratory, and museum collection techniques, as well as attendance at a lecture during the CAS Summer Systematics Institute organized by the Academy. Their hosts, Dr. Terrence Gosliner, Dr. Meg Burke, Ms. Christina Piotrowski, and Ms. Kelly Markelo, warmly welcomed them to their laboratory. The group also had a tour in the Invertebrate Zoology and Geology Collection Rooms of the Academy. The visit was also used as a venue to finish up several manuscripts for publication, as well as collate and prepare manuscripts for the Proceedings of the PSFBE, which is planned for publication by October 2016. 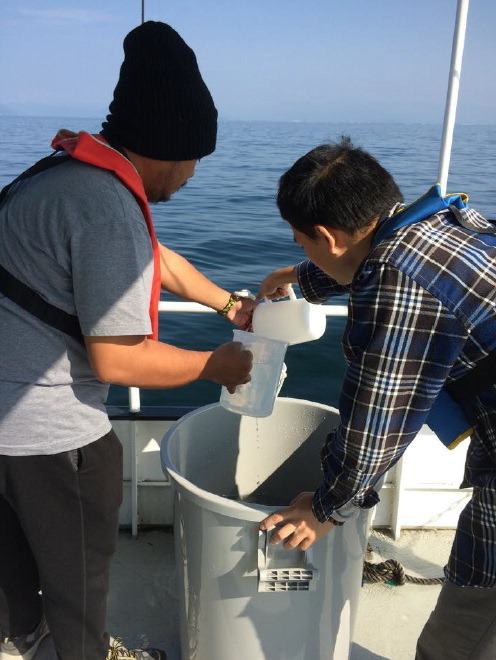 During this time, the team learned of the acceptance of a paper in the journal Plankton and Benthos Research, which was a major outcome of one of the research projects funded by the grant. The 1st PSFBE and the Taalaman exhibit were very good venues for the team to establish connections with government agencies, since many served as co-sponsors or co-organizers, including the Bureau of Fisheries and Aquatic Resources, the Biodiversity Management Bureau - Department of Environment and Natural Resources, the Protected Areas Superintendent of the Taal Volcano Protected Landscape, and other higher educational institutions such as the University of the Philippines and the Ateneo de Manila University, USAID, and the International Society of Limnology. As such, it really brought to the forefront the need for collaborative efforts to make worthwhile research and scientific events focused on freshwater habitats. The PSFBE in itself was a pioneering effort in the country which was able to successfully gather freshwater scientists from all over the country to share and discuss current research efforts on freshwater biodiversity and ecology. Before the culmination of the PSFBE, the PI convened a group of freshwater scientists to establish the Philippine Society for Freshwater Sciences (PSFS), which will become the only professional organization of freshwater scientists in the country. It aims to take over the organization of future PSFBE meetings and events, providing sustainability and continuity for the efforts initiated and spearheaded by the UST PEER group. The PI and the project postdoc both decided to take active roles in this organization. Furthermore, the Taalaman Exhibit provided a totally novel venue for the dissemination of research outputs on biodiversity and conservation biology, particularly for freshwater environments. This is actually not just the “lake’s first biomuseum” but it may be touted as the first ever biomuseum organized in a Philippine university. This is also the first time that organisms from Lake Taal were exhibited and featured in an event that has caught the attention of the general public, thus raising awareness of the need to protect and conserve freshwater biodiversity in the Philippines. As such, this may be considered as the start of a more intensified effort to put the focus on freshwater resources, not just in Lake Taal but also in other similar ecosystems throughout the country. The Taalaman exhibit, which was organized by a graduate-level class on Biodiversity and Conservation Biology, was also pioneering in the sense that it included the organization of an exhibit that served as the capstone requirement for the class. The PI and his team hope that this mechanism will be adopted by other courses in the UST Graduate School, which will serve as an alternative means of evaluating students of biodiversity. After Dr. Papa and his three colleagues return from their research visit to the California Academy of Sciences, the group will immediately plan for the transfer of their laboratory to the newly constructed centralized laboratory building at UST. The specimen collections of the project will be stored there, so preparations and plans for their proper relocation will need to be managed carefully. Several publications based on the results of the project are currently in preparation, while others are in various stages of review. The publication of the Proceedings of the 1st PSFBE, which will be published in the Philippine Journal of Systematic Biology as a supplementary issue, is also being planned. Several participants have already submitted their full papers for review, and a special guest editorial board will be convened to oversee the evaluation of the manuscripts, which also include several papers based on research conducted under the auspices of the project. All graduate students supported by the project are also due to complete their graduate studies later in 2016 or in early 2017. As the project is nearing its completion, the group is planning to come up with a roving exhibit aimed at extending the reach of the knowledge gained from the results of the different Lake Taal studies conducted by visiting schools, universities, government offices and other institutions with direct links to the lake.